Is it spring? I’ll drink to that! By Kristie January 31, 2013 Beer Dogfish Head Brewery Province Ale Co. Given that it’s now 27° colder than it was yesterday, I realize that it is not yet spring. But some sunshine and 70° temperatures were a welcome reminder that my freezing misery may not last forever. To celebrate the brief respite, Mom and I went to the beach (where else?) and that means Dogfish Head Brewing and Eats. We hadn’t been since well before Christmas and, normally, a visit on Wayback Wednesday would mean partaking in a vintage brew on tap. 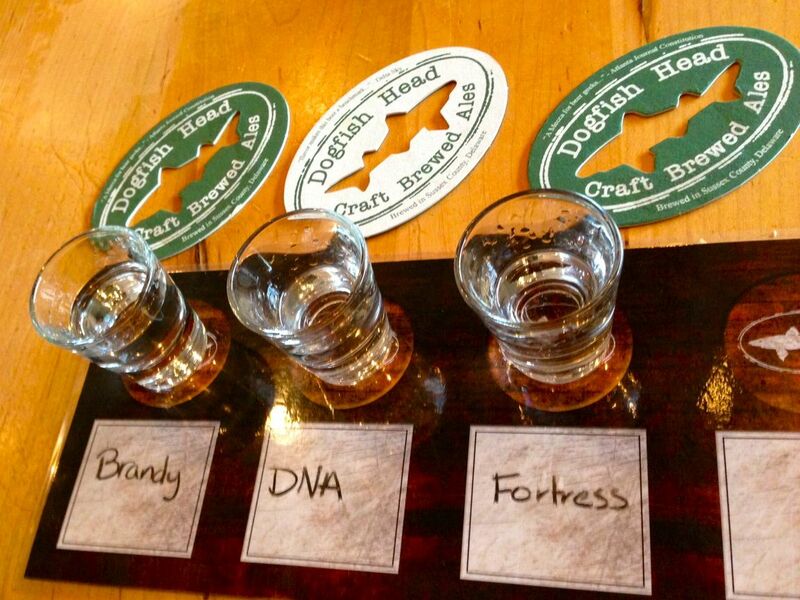 But, it’s been so long since our last visit, there were three untested brewpub exclusives. I’m a sucker for DFH’s genius marketing tool of “Limited Availability.” The idea that I may not have the chance to get something ever, ever again makes me want it. Bad. (Not to mention the compulsive hoarding). We got the first of the new Province Ale Co. beers, Province Ale Porter, and a Belma Pale Ale. So one malty, one crisp and hoppy (and a little less boozy), to round out our lunch. But when our server, Kelly, saw my genuine dismay at trying to choose two of the three, she kindly brought us each a taste of Hot Hazel, a product of the Small Batch Brewing Program. They were all very tasty with our Alpine Idyll pizza, but if I were going back today, I’d order the Hot Hazel. I love a dark beer, but this one is full of complex flavors that develop through each taste. There’s a richness of chocolate and hazelnuts, without being cloying, that ends with a slight pepper spiciness in the back of the throat. It’s not as overwhelming as some of the big stouts we often enjoy, but interesting and a nice change of pace. For dessert, we went for the flight of brand new spirits just released last week. There’s Pêche Brandy, made in the vein of summer seasonal Festina Pêche; and Delaware Native (DNA), sourced completely from Delaware ingredients, including blueberries and honey. But I was mainly interested in Fortress, distilled from one of our favorite and currently on hiatus beers, Fort. I was hoping for something to fill the giant, Fort-shaped hole in our lives, but alas, the resemblance is subtle. The generous half shot of all three was sufficient to sample each wonderfully unique creation, as well as end our lunch on a warm, tingly note. But we’re mostly too lazy to make cocktails and not prone to sipping liquor straight up, so these will not likely be on our regular rotation. One of these days, I’ll have to forgo the beer and try one of those intriguing house cocktails. Just happy for the one day of pretty nice weather, eating and drinking some of DFH’S newest formulas with my favorite person.